Well you said you wanted to do something a bit more adventurous. There are certain people who could never in a million years throw themselves out of a plane with just the equivalent of a giant silk hanky to stop them plummeting to earth. There are also the other kind who see such a course of action as the only way to get a real buzz! Its actually surprisingly easy to arrange. 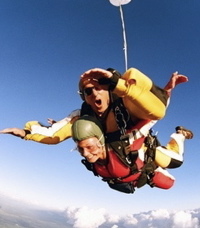 Many skydiving clubs offer easily affordable 1 or 2 day courses culminating in a jump. In fact many clubs and specialist companies actually go out looking for charity jumpers to take part. Some larger charities have special set ups with local parachute organisations making things even easier to arrange. To raise money all you have to do is find enough sponsorship to cover the fee and anything over that is profit for your chosen cause. Need help collecting the sponsorship / donations? We spent a day on the ground learning what was what and how to land properly. Then it was up in the plane. I thought I'd be more nervous but the instructor kept everything moving along so I hardly had time to think about it. Before I knew it I was sitting on the edge and out I went. There are a few heartstopping seconds as you wait for the static line to open your chute and then suddenly it opens and there you are. hanging there high up in the sky. Floating gently back down to earth. The thing I remember most was the quiet. After the noise of the aircraft it all suddenly went very still, and calm and quiet. It was lovely. And then I got the giggles. I had done it! Look at me doing a parachute jump! Who would have ever thought it? I pretty much laughed all the way down and just remembered how to roll over as you hit the ground. This really was one of the best things I have ever done. I was so proud of myself and I raised tons of money for my charity. I thought I would struggle just covering costs but people were really generous and offered a lot more than they would for a normal sponsored event"
Don't fancy going alone? Sign up for a tandem jump. This is especially good for older people or those less fit and able. You are basically strapped to an experienced instructor. Jumping with them and coming down under the same parachute. This involves a lot less training. It also often means that some unlikely candidates can make the jump they always dreamed of. This can also lead to greater levels of sponsorship. There is no doubt that Parachuting Pensioners flinging themselves out of airplanes with gay abandon can really bring in the cash! So if you fancy a real fundraising challenge with a difference. why not......Reach For The Sky!